Android L looks awful pretty. 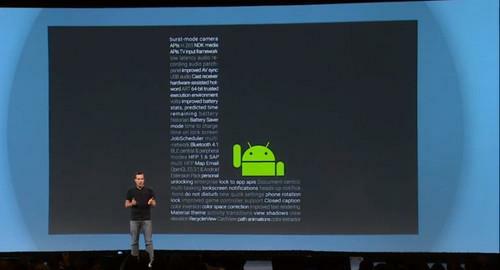 Google’s introducing a new aesthetic dubbed Material Design in Android L, with a focus on object depth and animation. Concurrent with the debut of L, new physical devices were unveiled at I/O, chief among them Android-connected smartwatches, a TV system, and car interface. L, for its part, promises faster runtime, enhanced battery life and new security features. But Google's also gung-ho about L's ability to make apps look pretty. Google calls L's underlying design aesthetic "material design," because it allows for a look that resembles the physical aspect of materials and objects. The system's tools will let developers apply visual flourishes to their apps to make them look less flat and static, and more dimensional and fluid. Developers can specify an elevation value for different elements in their app, to make them seem to jump from the screen. It seems like the opposite of the flat design Apple went for with iOS 7. There are also tools for adding virtual light, shadows and animation when people tap on buttons and perform different activities in apps. "It's delightful when touch is rewarded with motion," said Matias Duarte, Google's VP of Android design, referring to the animated effects, during the keynote on Wednesday. But do they add up to a gimmick? Some attendees weren't all that impressed by the conference's focus on visuals. "It's a bit superficial," said Dennis Linnell of Gate Technology, an IT consulting company based in McLean, Virginia. The design-oriented new APIs (application programming interfaces) are focused more on form over function, and won't necessarily lead to better apps, he said. During the show, Google almost seemed to be treating material design like a new religion. Marketing kits on the topic were handed out to developers and journalists alike, with cards focused on tenets like "one design," and "meaningful motion," and a blank sketch pad for developers to brainstorm ideas by hand. "Our goal is to satisfy the diverse spectrum of human needs," read the text on one of the kit's flaps. L's "material design" could help Google stand out as it seeks to better compete against Apple, which has succeeded partly due to the design of its products. The new focus on design principles is, "a reflection of Google's maturation as a company," said Greg Sterling, an industry analyst with Opus Research. "They've done the platform, they've done the functions ... now they're moving into these nuanced areas of design," he said. Android is already the dominant mobile OS, now with over 1 billion active monthly users, Google's Sundar Pichai, senior VP of Android, Chrome and apps, reported during I/O. But with more devices coming, Google is looking to strengthen Android as a development platform make the user interface more visually appealing at the same time. It's a tall order. Google says its focus on design will evolve. At the moment there are over 5,000 new APIs in L for developers to design and build their apps for new form factors like smartwatches. The company has also put out style guidelines for developers. This emphasis on design might just be a key to Google's future success, given how consumer attitudes change about appearance. The concept of material design did generate interest among developers at the show. "I think it's the right strategy. The designs are very nice," said Thomas Soule, co-founder and lead Android developer for the news app News Republic. That might be the best way to look at Google's material design. Whether it makes Apple nervous or not, it could help Google shed some of its geeky, engineering image.